Miss Jessies Creme De La Curl Cleansing Creme Finally, a no lather sulfate-free shampoo that leaves your hair and scalp silky smooth. 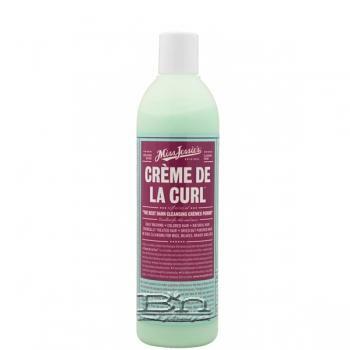 Creme De La Curl is a no lather, sulfate-free formula that offers a better kind of clean. One that cleanses your hair and scalp without stripping the natural oils. It removes product buildup and washes away the daily grime without leaving your hair or scalp dried out. Suds-free cleansing, hydration and moisturizing elements help the hair and scalp maintain a healthy luster. Fresh scented formula for dehydrated and color treated hair is gentle enough for use everyday. Direction: Wet hair thoroughly. Evenly distribute a palm full of Creme De La Curl between both hands and distribute to hair and scalp. Use circular massaging motions to eliminate dirt and protect residue. Gently comb fingers through hair and rinse with water. Follow up with Miss Jessie's Creme De La Creme moisturizing conditioner. Style with Miss Jessie's Curly Pudding, Curly Meringue, Curly Buttercreme or Baby Buttercreme, Quick Curls or Stretch Silkening Creme.